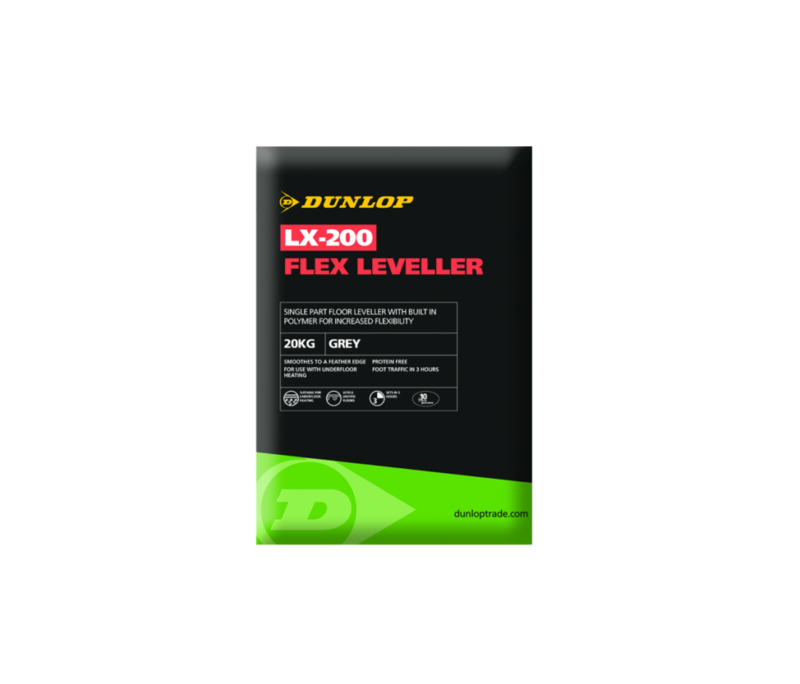 DUNLOP LX-200 FLEX LEVELLER is a single-part floor leveller with built-in polymer for increased flexibility. Suitable for preparing interior floors prior to laying sheet and tile soft floor coverings, natural stone, porcelain and ceramic tiles. It can be used on a wide range of absorbent and non-absorbent floor surfaces including concrete, cement:sand screeds, terrazzo, asphalt, quarry tiles and old but sound adhesive residues. It can be laid at depths from a feather edge up to 5mm and from 5mm-20mm with the addition of 3mm granite chippings. Depends on the nature and flatness of the surface and the thickness of the application, but approximately 20kg of DUNLOP LX-200 FLEX LEVELLER will cover 4m².